Foundation 56 is a breast cancer outreach program dedicated to providing access to quality services and resources for breast cancer patients and survivors. 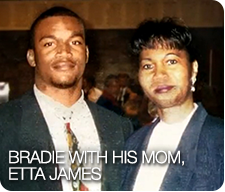 Foundation 56 is a tribute to Bradie’s mother, Etta James, who died from the disease in 2001. Bradie often says if there had been the types of services offered because of Foundation 56 his mother would still be alive. The Foundation supports education, mammogram screenings, diagnostic testing and more. Bradie James’ Foundation 56 is a breast cancer foundation. While we would like to be able to fund all critical needs, Foundation 56 is 100 percent focused on serving those with breast cancer.